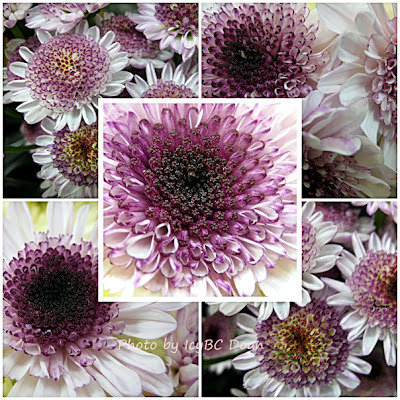 This beautiful lavender heart and white petals daisy were found at a grocery store, and I haven't seen it before. It came in a bouquet with different flowers, but since the heart has that tint of purple, of course, I was drawn to it immediately. The lighting in the store wasn't an ideal situation, nor the cold air of the frig. I quickly pulled out my camera and just shot a few photos without much thought going into it. Plus, the store doesn't really like people taking pictures inside. It's their rights I suppose. In a few days, these beautiful lavender daisy bouquets will be thrown in a grocery shopping baskets, and mark down for sales. Some will be bought, and the rest of them will be tossed out. The life cycle of cut flowers is very short and sad. Oh what beauties! I would probably would have bought them! I've never seen one like that before either, wow.